You’ve arrived in New York City with your luggage in hand and your hopes in store. With only 48 hours in the big city, where do you start? As the city that never sleeps, it’s easy to feel overwhelmed by the hundreds of things to do and see. Lucky for you, New York has something for everyone. Your 48 hours starts now! Among the Big Four fashion capitals of the world, New York coined the phrase “shop till you drop.” The optimal day for the shopaholic starts in SoHo – one of the city’s most eclectic shopping regions. From designer boutiques to bargain emporiums, SoHo seems to have it all. After a morning in SoHo, make your way to Greenwich Village, stopping at Washington Square Park to refuel and recharge. The Bleeker Street shopping scene entirely plays tribute to the village’s rich musical history. On the weekends, your likely to catch local musicians and vintage street markets. Next on the shopping tour is the modish Meatpacking District. Don’t be misled by the cobblestone streets – this trendy district defines high-end shopping. Cap off a long day of shopping with a cocktail at the Gansevoort Meatpacking NYC rooftop. Wake up the next morning and do it all over. Spend the day with Tiffany, Cartier, and Prada on the famous Fifth Avenue. Whatever your taste, New York is home to hundreds of Michelin-star restaurants and authentic dives for locals and tourists alike. We recommend beginning the day with brunch on the Lower East Side. From Sadelles to Stanton Social, this progressive neighbourhood has quickly become an NYC brunch hotspot. Walk off that boozy brunch on the High-Line in Meatpacking District, taking in picturesque views of the city. Still hungry? Check out Chelsea Market for a range of delectable bites and snacks. Time for happy hour. Head over to the Standard Biergarten for a well-deserved beer and a game of ping-pong. We promise your food coma is well worth it and is sure to give you a good nights sleep. 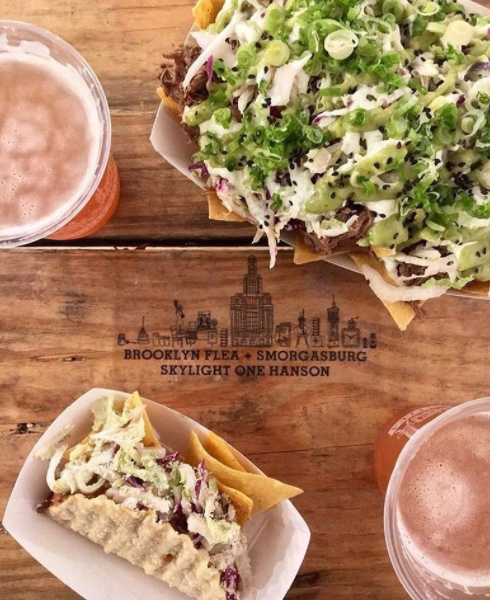 Cross over to Brooklyn on day two for the infamous Smorgasburg food market. As the largest open-air food market in America, Smorgasburg is sure to be a foodie fan favourite. Spend your morning surrounded by the history of Ellis Island, accompanied by the Statue of Liberty herself. Catch the ferry back to the city and head over to the Rockefeller Center. Tour Radio City Music Hall and take the elevator up to the Top of the Rock Observation Deck for exquisite views of the city skyline. More views? Spend sunset at the Empire State Building, ending off the night with a visit to Times Square. The day may be over, but the action never sleeps. No trip to New York is complete without Central Park. Wake up the next morning and embrace your inner New Yorker. Grab a coffee and bagel to enjoy throughout your stroll down Central Park. Make sure to visit the John Lennon Memorial, if you’re lucky you may stumble across a private concert! 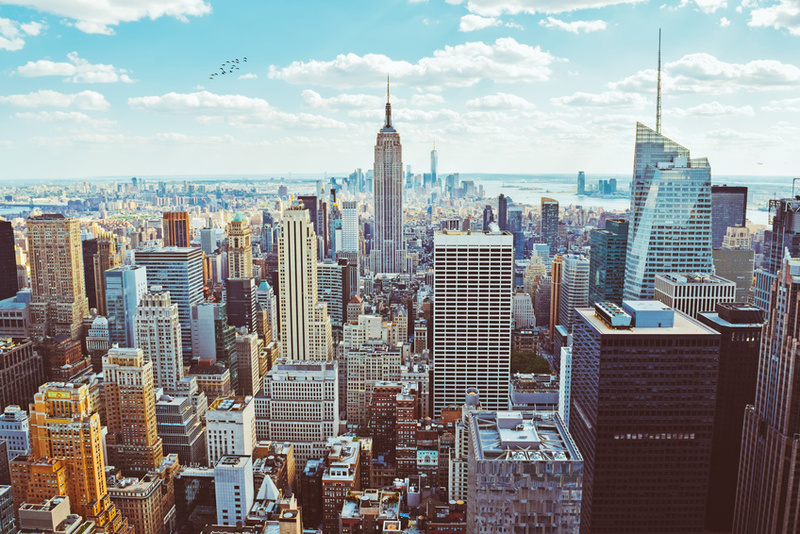 As a cultural capital of the world, New York boasts a variety of galleries, museums, and theatres. 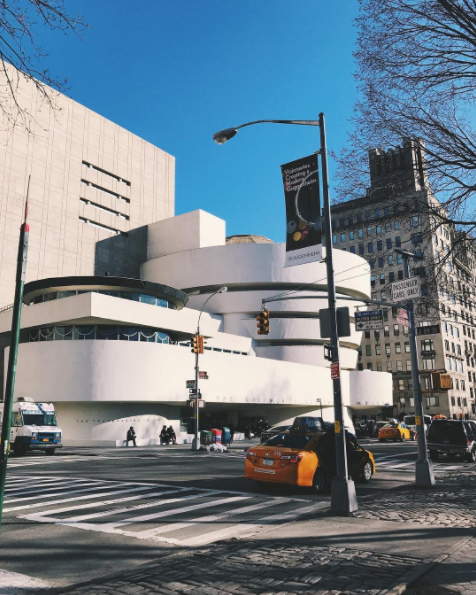 Visit the world famous Guggenheim Museum and the Museum of Modern Art. Spend the afternoon at a Broadway Matinee, and cap off the night laughing at the Comedy Cellar. You never know who will show up and surprise you. Spend day two in hipster-haven Brooklyn. Explore Williamsburg, grab a book from Mermaids and pass the afternoon reading in McCarren Park. You’re sure to enjoy some peace and quiet away from the bustling city. While in Brooklyn, make your way to Dumbo. Often overlooked, this waterfront neighbourhood boasts breathtaking views of the Manhatten skyline. Ride your bike around town and embrace the culture.